Just a few of the questions we’re hearing all the time. ConsoleWorks® is the leading cybersecurity/operations platform on the market. The ConsoleWorks Server is a high-performance engine that handles information flow processing, business rule execution, pattern matching, role-based security, and signed log-file generation. It handles all input and output across the enterprise on the devices and applications that it manages, serving this data up as needed. ConsoleWorks is capable of managing more than 1000 connections per server invocation. ConsoleWorks acts in a multi-dimensional fashion by monitoring not only the applications but also the servers, virtual machines, network and storage devices that run them. It provides managers and privileged users a single end-to-end management solution that controls access, that monitors and manages all log files, RDP and VNC sessions, automates password management and configuration monitoring, and watches for specific events that may occur across the organization. It does it in real-time and in all machine states – power on, single user, maintenance, production and failure modes. Its persistent connection also locks down the “back door” entrances that are overlooked by similar, agent-based solutions. The end-to-end view, provided by ConsoleWorks, helps users quickly understand WHY something went wrong and quickly determine and implement the resolution. During that process, ConsoleWorks captures the exact steps used by an experienced user to remediate an issue and stores it in the knowledge base for future reference. What are the key features of ConsoleWorks? Privileged Interactive Access – ConsoleWorks controls access by allocating specific permissions/ privileges to a user based on the ConsoleWorks Role-Based Access Control (RBAC) permission model. The permission model specifies which assets a user may access and at what level of privilege they may access those systems. ConsoleWorks supports command-by-command privilege grants for absolute control over electronic access. The ConsoleWorks solution supports integration with an IAM solution and supports RBAC from an Active Directory server. The product was designed with the open ability to integrate its authorization/ authentication services with other technologies, as well. In addition to command line sessions, ConsoleWorks has the ability to capture complete recording and playback capabilities for privileged user sessions, across RDP/VNC and even web applications. Users gain a complete, detailed account of what happened on sensitive systems, and who performed a specific activity. Asset, Patch & Configuration Monitoring – The overriding purpose of configuration monitoring and management is to maintain asset configurations at a known state that have the highest level of security. ConsoleWorks automates the collection, comparison, alert/notification and auditing of any changes to configurations, eliminating the majority of human errors and minimizing the impact of intentional or unintentional erroneous activity. Endpoint Password Management – From one central location, ConsoleWorks can be configured to schedule automatic password changes and set reset date warnings to meet compliance standards. Operationally, it can recover or change a password securely. When passwords are changed or recovered (for example, in the event of an emergency), notifications can be configured warning the appropriate personnel that it has occurred. The ability to change passwords on demand are controlled through ConsoleWorks granular Access Control Rules. 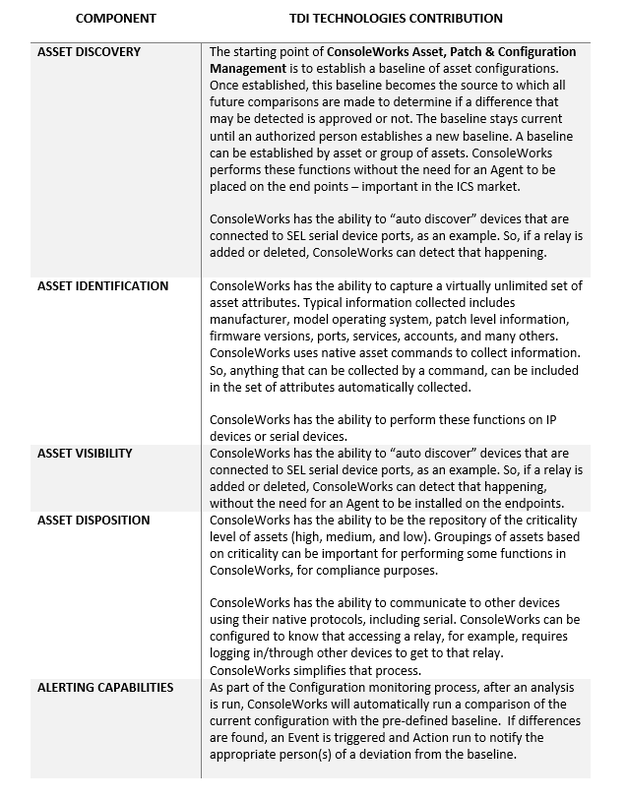 Logging & Situational Awareness (Logging and Monitoring) – ConsoleWorks can monitor and manage almost any application or infrastructure interface – including routers, switches, servers, firewalls, virtual machines, PLCs, RTUs, appliances, applications and networks – to provide the most comprehensive record possible. Event Monitoring – ConsoleWorks watches for messages, or Events, in the data streams of all the devices and applications it manages. When ConsoleWorks detects an Event, it alerts the appropriate personnel in real time, records the circumstances, and automatically performs the default or customer-configured response(s). Users are able to respond to the device or application error condition and immediately view the vendor-supplied explanation along with steps required to resolve the issue. Logging & Log File Aggregation – ConsoleWorks monitors the asset logs in the context of all other managed applications or hardware. Its ability to aggregate error conditions across all log files enables users to view multiple log files, in context, to help in root cause analysis. In many cases, issues have been resolved before other solutions have been notified that an Event has occurred. Keystroke Logging and Best Practices – ConsoleWorks captures the steps taken for Event remediation down to the keystroke, enabling any ConsoleWorks user to leverage in-house past experience and acquire proven solutions faster. In this way, ConsoleWorks builds the business’s data warehouse of intellectual property related to the problem resolution. Proof of Compliance – ConsoleWorks produces, aggregates and summarizes audit logs that record user activities, exceptions, and information security events. Log files are digitally secured (line-by-line) for each asset, operating system, application, etc. as they are written, allowing detection of line deletion, insertion or modification. What differentiates TDi Technologies from other solution providers? TDi delivers an enterprise infrastructure management solution which incorporates IT regulatory compliance, log management, real-time monitoring and alerting, remediation, and security for physical (machines, cables, servers, hubs, routers, switches, etc. ), logical (remote access, SANS storage device connections), and virtual (virtual server, virtual machines) devices and applications. We access the components of the extended data centers in a unique way that allows us to apply a new approach with new technology, allowing us to maintain secure, constant, persistent contacts with all components of the data center everywhere from anywhere, independent of the presence of an operating system and without bandwidth constraints. By delivering agentless management technology which begins managing devices as soon as power and a network cable are installed, we are able to detect that a component is in trouble before it goes down along with an immediate path to remediation to anywhere from everywhere. The result is greater time between failures, quicker remediation of failures, and a more efficient use of personnel, all of which result in a quick return on the investment. 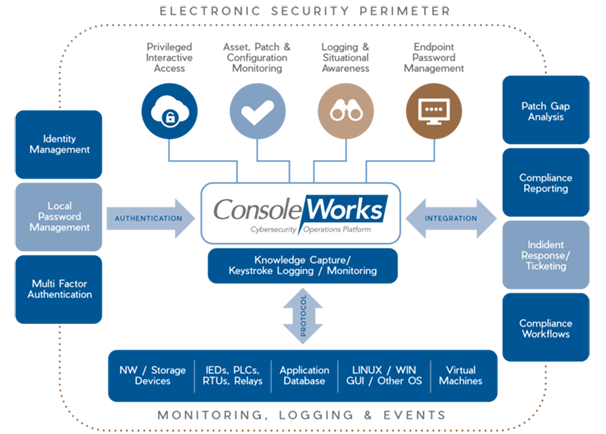 How does the ConsoleWorks platform address IT and OT (ICS) environment differences? ConsoleWorks is an on-premise Privileged Account Management and Password Management platform for privileged users accessing IT and OT (ICS) devices including Windows and Linux servers and virtual machines, routers, switches, RTUs, PLCs, SCADA devices, etc. It is a single, vendor/protocol agnostic, end-to-end solution that controls access, logs user activity, and monitors SSH, Telnet, RDP, VNC, Serial, and other types of connections that are prevalent in today’s IT and OT (ICS) environments. It does so in real-time and in all machine states – power on, single user, maintenance, configuration, production, and failure modes – without the need of a software Agent installed on the endpoint. It also locks down the “back door” entrances that are overlooked by similar solutions. Vendor and protocol agnostic enabling support beyond the standard IP connectivity to include serial and others required in ICS environments where systems have been around for many years and have a specific purpose. ConsoleWorks is an ICS security and operations platform that provides the security perimeter around the critical ICS devices. ConsoleWorks provides a unified security approach to ensure privileged access is controlled and risk is mitigated. Our approach dramatically simplifies the security practice and addresses the vulnerabilities with privileged access that present an extremely high-security issue today. 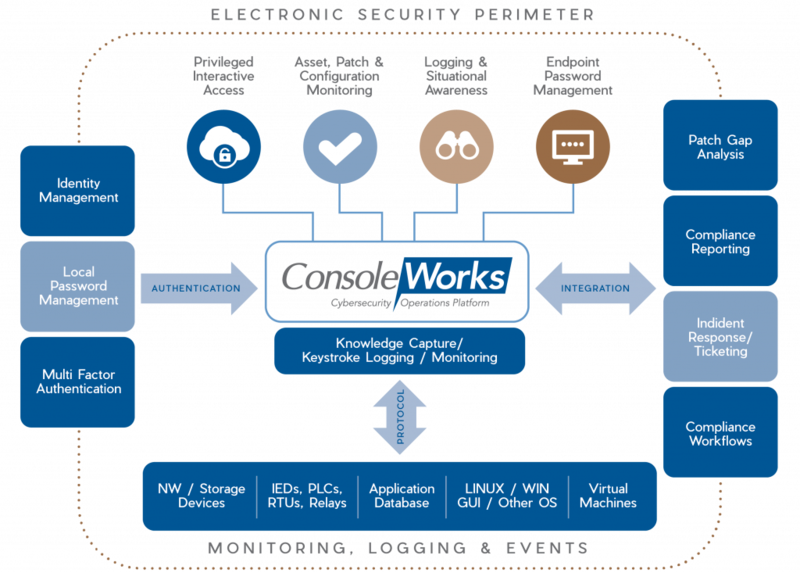 What is the ConsoleWorks approach to Privileged Interactive Access Management & Device Monitoring? ConsoleWorks maintains a persistent, secure connection to physical and logical infrastructures to monitor user actions, machine state activity, and all defined incidents worth knowing about. ConsoleWorks also implements various levels of physical and logical security to provide necessary – and often required – protective measures. ConsoleWorks can be programmed to trigger pre-defined, real-time, enterprise-wide responses to security incidents. ConsoleWorks enables strong password implementation, access restrictions by task, by role, and by policy, and user authentication internally (through username/password protocols) and externally (from sources including Windows® Active Directory Domain Services, PAM, and RSA® SecurID®). ConsoleWorks supports a robust task-based/role-based privileges model based on user-defined Access Control Rules. Access Control rules enable administrators more granular and graduated control over what specific users can do inside ConsoleWorks and how they can use ConsoleWorks to access and interact with managed assets. Virtually all computer, network, and similar devices have a communication port through which these devices send boot and status messages. Usually, this console information is lost because it is impractical to monitor and respond to the geographically scattered computing infrastructures common in modern-day businesses. ConsoleWorks stops this data loss by bringing all the once-discarded console information, status updates, error messages – basically everything in the data stream – back to a single, web-enabled server, looking it over, and responding intelligently. How does ConsoleWorks handle Configuration Monitoring? 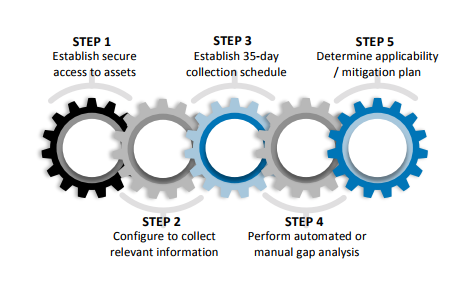 ConsoleWorks automates the collection, comparison, alert/notification and auditing of any changes to configuration baselines, eliminating the majority of human errors and minimizing the impact of intentional or unintentional erroneous activity. ConsoleWorks has the ability to speak multiple protocols (including serial), gaining access to and then collecting the inventory is a fundamental capability of the product. ConsoleWorks does this without adding an Agent to the endpoint, which is a requirement in the ICS environment since many of these devices are purpose-built and cannot have other vendor software installed on it. Versions of software currently installed including BIOS, firmware, operating system, applications, etc. What is ConsoleWork’s Automated Patch Analysis? THE NEW, AUTOMATED PATCH ANALYSIS PROCESS FROM CONSOLEWORKS WILL BE APPLICABLE TO VARIOUS IT/OT PATCHING PROCESSES INCLUDING, PCI-DSS, NIST 800-53, HIPAA, NERC CIP AND OTHERS. NERC CIP-007-6 / R2 requires a patch management process for tracking, evaluating, and installing cybersecurity patches for applicable Cyber Assets, including device drivers. Many utilities see this is a grueling task, requiring many, many man-hours to meet the “every 35-day analysis” required by NERC CIP. The ConsoleWorks Automated Patch Analysis solution greatly simplifies the process of gathering the information required for patching IT and OT devices – beyond the HMI. For meeting NERC CIP compliance, ConsoleWorks establishes a secure access to access all devices and then is configured via a schedule to perform the patch analysis every 35 days, keeping a log, for audit purposes, of when the analysis was run. Once the current patch state is gathered by ConsoleWorks, ConsoleWorks can integrate with industry or custom solutions to assist in automating the patch gap analysis. In these cases, ConsoleWorks sanitizes, anonymizes, and encrypts the data before initiating the secure transfer of the collected device information. After the initial collection is sent, ConsoleWorks can be configured to continually monitor for the patch gap analysis results. When available, ConsoleWorks automatically downloads and processes the results, using ConsoleWorks Events as an indication to the user when patches are available. Event Severities further indicate whether an available patch is a security patch. Finally, ConsoleWorks produces dashboard report views to organize and communicate the current patch state. ConsoleWorks presents a summary report containing information on patch gaps that may exist for each asset, including links to any available patch for downloading directly from the vendor site. At this point, a utility will evaluate the available security patch for applicability and make the decision to install the patch or initiate a mitigation plan. ConsoleWorks’ integration with workflow management solutions enables utilities to further automate the patching and mitigation processes as required by NERC. The patch analysis features will be available in ConsoleWorks in Q2, 2018, and are part of a larger cybersecurity and operations platform solution addressing IT/OT patching processes for PCI-DSS, NIST-800-53, HIPAA, NERC CIP V6 ( CIP-005, CIP-007, CIP-010, and CIP-013) requirements for Secure Remote Access, Asset and Configuration Monitoring, Endpoint Password Management, Logging and Situational Awareness and Supply Chain. How does ConsoleWorks Address GDPR regulations? The EU General Data Protection Regulation (GDPR) has been designed to protect how personal data of EU citizens is collected, processed and stored. This requires companies to evaluate their data strategy as to how they collect and store data, who has access to the data and implement policies to ensure compliance with GDPR. GDPR requires companies to implement granular controls to protect access, and set and enforce clear roles and responsibilities for access to the systems that hold personal data. ConsoleWorks Privileged Interactive Access enables companies to proactively protect their privileged credentials and secure remote access to devices and systems for inside privileged users, vendors, and contractors. ConsoleWorks ensures that every remote access connection made by our customers, whether a privileged user connecting to a critical system or device or a help desk connecting to a user, is secure. ConsoleWorks protects critical systems and data while helping companies meet the data privacy requirements of GDPR. Control and limit access to sensitive personal data to only the privileged users’ authorized level. Automatically capture detailed audit trail that documents all session activities and credential usage. Significantly reduce the time involved in collecting the data required to support an audit and producing the reports to prove compliance. How can ConsoleWorks improve auditing and compliance reporting? ConsoleWorks keeps detailed audits of administrative, user, and incident activity. These audits show who did what, when they did it, and what was added, deleted, or modified within the managed asset. ConsoleWorks can be configured to provide reporting to assist in compliance with PCI, HIPAA, SOX, SAS 70, and NERC CIP requirements. ConsoleWorks can apply digital signature technology to log files, for the purpose of detecting record tampering, such as the modifying or deleting of log entries. Coupled with timestamp log entries, ConsoleWorks provides sequenced, tamper-evident logs for compliance and incident forensics. How is the ConsoleWorks approach to Security different from other Security solutions? ConsoleWorks maintains a persistent, secure connection to physical and logical infrastructures to monitor user actions, machine activity, and all defined incidents. ConsoleWorks implements various levels of physical and logical security to provide necessary—and often required—protective measures. Centralized command and control for enterprise-wide physical and logical connections, Syslog messages, SNMP traps, and other streams of information. How can ConsoleWorks be used to manage Virtual Machines (VMs)? Virtual Serial Ports provide an important technical capability for enhanced management of virtual environments. ConsoleWorks leverages this capability to deliver enterprise-class compliance and security capabilities as well as further optimizing IT operations for virtual environments. Optimize IT operations for virtual environments -An important part of reducing management costs – while maximizing availability and reliability of systems – is the ability to correctly identify, diagnose and remediate issues and problems. This is a critical differentiator of ConsoleWorks, driving significant productivity enhancements of for many ConsoleWorks customers. ConsoleWorks enables all of the IT operations benefits for virtual environments that are already being realized in traditional IT infrastructure environments by our customers. Security and compliance issues in virtual environments – ConsoleWorks maintains console connections in all modes of operation, including during VM migrations. In addition to maintaining the IT infrastructure security model over privileged interfaces (consoles, virtual serial ports), ConsoleWorks can capture all log file data generated by hypervisors (which includes VM logs). This provides comprehensive data collection of all events, information and actions (provisioning VMs, moving VMs, configuration, maintenance, repair, etc.) that can support even the most rigorous compliance requirements. It also provides a degree of transparency into virtual environment that directly enables oversight, auditing, and management. What are the ConsoleWorks Intelligent Event Modules (IEMs)? Intelligent Event Modules (IEMs) are vendor event reference libraries that contain the proper priority designation as defined by the vendor or manufacturer and descriptive event definitions for detected events that transform cryptic event codes into human-understandable error definitions – simplifying the diagnosis activity and time to solve. IEMs provide ConsoleWorks with a watchlist of text messages, including error codes, system warnings, and status alerts, produced by an information source in the IT environment. ConsoleWorks watches for these messages, called Events, in the data streams of your managed systems, devices, and applications. ConsoleWorks IEMs improve IT operations – IEMs dramatically improve the ability to streamline and optimize IT Operations by eliminating time-consuming event prioritization and research activities. With IEMs, events captured by ConsoleWorks that are in the vendor IEM “library” are automatically matched, assigned the appropriate priority, and presented with their human-readable definition. This enables administrators, engineers and technicians to use their time for value-add issue or problem resolution rather than priority assessment or event code researching. ConsoleWorks IEMs enable continuous process improvement – IEM technology can be used as a domain knowledge repository. The user can define custom events so that when these events (or event combinations) occur again they will already be properly prioritized and described. The end user can also update IEMs with recommended remediation actions by event – even to the inclusion of the exact sequence used to correct the problem, previously. So, a less knowledgeable or less experienced administrator is now armed with the exact steps that were used by the expert to successfully remediate the error or incident. What is TDi’s participation in the NCCoE Securing Picture Archiving and Communications System (PACS) project? The National Cybersecurity Center of Excellence (NCCoE) is pleased to announce the initial set of technology partners for the Securing Picture Archiving and Communication System (PACS) Project: Cisco, Clearwater Compliance, DigiCert, ForeScout, Hyland, Symantec, TDi Technologies, Tempered Networks, Tripwire, Virta Labs, and Zingbox. We expect to finalize additional technology partners to fulfill the project’s required components and capabilities. In response to a call in the Federal Register, these companies submitted capabilities that aligned with desired solution characteristics. The technology collaborators were extended a Cooperative Research and Development Agreement, enabling them to participate in a consortium where they will contribute expertise and hardware or software to help refine a reference design and build an example standards-based implementation. To learn more about the project, read the project description. These vendors will work with the NCCoE project team to provide a practical solution for securing the PACS ecosystem. The result will be a freely available National Institute of Standards and Technology (NIST) Cybersecurity Practice Guide (NIST’s Special Publication 1800 series) that includes a reference design and a detailed description of the practical steps needed to implement the solution based on the NIST Cybersecurity Framework, and industry standards and best practices. If you would like to join the Healthcare Community of Interest to help guide this project and provide feedback, please email us at HIT_nccoe@nist.gov. CryptoniteNXT, ForeScout, Häfele America, Remediant, StrongKey, and TDi Technologies have joined the National Cybersecurity Center of Excellence (NCCoE) as technology collaborators in the Securing Property Management Systems project. * In response to a call in the Federal Register, these companies submitted capabilities that aligned with desired solution characteristics listed in the project description. The technology collaborators were extended a Cooperative Research and Development Agreement (CRADA; see example) enabling them to participate in a consortium where they will contribute expertise and hardware or software to help refine a reference design and build an example standards-based implementation. This collaboration will result in a publicly available Cybersecurity Practice Guide (NIST Special Publication 1800 series) that will document a reference design for hospitality organizations to improve the cybersecurity within and around a property management system (PMS). The role of technology in the hospitality industry is growing rapidly, and the PMS is increasingly integrated with systems and services that extend well beyond front desk operations. As the operations hub, the PMS interfaces with services and components within a property’s IT systems, such as Point-of-Sale systems, door locks, Wi-Fi networks, and other guest service applications. Adding to the complexity of connections, external business partners’ components and services are also typically connected to the PMS, such as on-site spas or restaurants, online travel agents, and customer relationship management partners or applications. This expanding PMS ecosystem provides a wider attack surface for vulnerabilities to be exploited by malicious actors. Improper configuration of the diverse applications that connect to or run through a PMS can create cybersecurity vulnerabilities. In partnership with technology collaborators, the NCCoE will build the reference design in a lab environment. The following diagram depicts the reference design’s high-level architecture. The reference design will use commercially available products from the project’s technology collaborators—CryptoniteNXT, ForeScout, Häfele America, Remediant, StrongKey, and TDi Technologies—along with open source products. If you have additional comments, questions, or would like to join the Community of Interest helping to guide this project and provide feedback, please email us at hospitality-nccoe@nist.gov. What is TDi Technologies’ Role in the NCCoE Energy Sector Asset Management Project (ESAM)? This project is moving into the build phase. NCC0E selected several technology collaborators for this project. Companies that have been selected to participate have signed a Cooperative Research and Development Agreement (CRADA; see an example) with NIST. Download the Energy Sector Asset Management project description for an overview of this project. Sign up for email alerts from the NCCoE to receive updates on our Energy Sector projects. If you have questions or would like to join our Community of Interest, please email the project team at energy_nccoe@nist.gov. What is the joint project between FoxGuard, TDi and the DOE? FoxGuard Solutions, Inc. and partner TDi Technologies recently completed a multi-year project to create a safer national power grid by simplifying the process of patching and updating energy delivery control system devices. The solution is the result of a $4.3 million Cooperative Agreement awarded in 2013 from the U.S. Department of Energy’s Cybersecurity for Energy Delivery Systems (CEDS) division. What are key product points, or differentiation regarding ConsoleWorks? The quotes are from various slide presentations, speaking engagements and conferences.